Exped Mat Sheet Hyperlite - Sized to fit all Exped countoured mats. 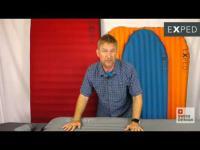 Bed linen for Exped Hyperlite sleeping mats. Sized to fit all Exped countoured mats.